“By indicating that he has the divine authority to forgive sins, Jesus naturally arouses immediate reaction from the Scribes and Pharisees. Since they correctly believe that only God can forgive sins, they reject the possibility that Jesus himself is divine and conclude instead that he is guilty of blasphemy. In addition to the written law given through Moses, the Pharisees accept as equally binding the oral traditions of the rabbis, which traditions have evolved into a highly ritualistic set of religious observances. So when Jesus and his disciples violate some of these traditional rules, the Pharisees are highly offended. “Despite lowly beginnings, news of Jesus’ birth spreads quickly throughout Judea and even beyond its borders. Matthew records the account of a visit to Bethlehem by certain philosopher-priests, or Magi, who are prompted to travel the great distance to Jerusalem because of a star which appeared at the time of Jesus’ birth. Joseph and Mary find accommodations in a house and it is in this house that the Magi’s gifts are offered to the newborn ‘King of the Jews’. King Herod is alarmed by the Magi’s visit because he believes Jesus’ birth poses a political threat to his reign. Because of this, Herod sends his soldiers to Bethlehem to kill all male children who might have been born within the time frame suggested by the Magi’s calculations. “Little more is known of Jesus’ first 30 years. It is known that Jesus has at least four brothers — James, Joses, Judas (Jude), and Simon — and also some sisters, who are not named. Because there is no further reference to Joseph, it appears that he probably died while Jesus was still a relatively young man. For many years, then, Jesus evidently has provided for his family by working as a carpenter, having learned the trade from his father. So, I have been challenged. Today is “Ash Wednesday” in the Catholic religion, which kicks off the season of “Lent.” All I remember (from my growing up years in the Catholic church) about Ash Wednesday was when I attended an Ash Wednesday service with a friend of mine while I was at college in LaCrosse. I went up front, they schmeared some “ash” on my forehead in a cross shape…and I heard that you would pretty much go to hell if you wiped it off. Well, I wiped it off and headed out to the bars!! Not a terribly moving or meaningful experience, obviously. And, all I know about Lent is that you had to give something up for a set amount of time. I never understood that. I remember a dear friend in High school giving up caffeine one time. That just didn’t make sense to me… why would you do that?? So, we are to set aside time to reflect and thank our Father in Heaven for what He has done for us. A time for us to sacrifice (whether it be large or small) so that we might be reminded, and reflect upon WHY we have been placed on this earth. What an incredible chance to show our creator the love we have for Him!! So, on that note…for this season of Lent…holding you all as my witnesses…I will be taking part in 40 days of sacrifice. Would someone please warn McDonald’s that they won’t have to order as much Diet Coke?!! To you, that may not seem like a big enough sacrifice…but to me, quite frankly, it’s huge!! I am interested to see how God will use this time…how He might change me, and ultimately bring me closer to Him. Tristan is Start Student this week in his 1st grade class, which means he’s top dog. He gets to fill out a “Read All About Me!” poster, bring in a favorite book and photos to display in the special Star Student spot, he gets to be first in line for lunch as well as lead when going to other classes and then on Friday, when he shares his photos and poster with the class, he gets to read his favorite book aloud. “What’s it about? !” I quizzed…and he told me. Everything! He knew the story! Okay then, I thought. Looking back now I should have realized how much that book meant to him, especially when Monday morning rolled around and the only thing he remembered to bring to school with him was the book, but I didn’t give it a second thought until a few days passed. Honestly, it wasn’t a shocker. Sure it was a bummer but T’s a reader and I figured he had plenty of favorite stories to choose from. I’m sure he won’t care too much about it, and I said as much to his teacher. “Oh gees,” I thought, “poor girl.” Tristan’s teacher is a 2nd year teacher…quite young, and I was embarrassed a bit by Jax’s response. I agree with him of course, but like Tristan’s teacher I figured this wasn’t a huge deal and Tristan could just bring in another book. She was just following the “rules” after all. Now this really is a mess, I thought. He told me about the book and that they can’t read it in class. “Why?” I said testing him to see how much he knew about it. “She said I have ‘plenty of favorite stories’ and to bring in another book,” eerily echoing the exact phrase I said to his teacher, “but I don’t!” He exclaimed. “Sure you do, T!” I said. His words hit me like a blow to the gut, I felt them cut straight to my heart. I never liked kids. Growing up I never enjoyed babysitting or being around kids and was a common belief among my friends that either I would be last to have kids or not have any at all. I always thought they were annoying; smelly, whiny, loud and foolish. But even God’s word tells us that it’s the the innocence and unwaivering eyes of a child that we will know truth and have faith. Now that I have children of my own (I can still hear the collective and shocked gasp from my friends) I fear I still don’t truly get how much they understand. Children love and trust unequivocally. Their thinking is simple and sincere and has not yet been corrupted by others. They don’t need to have answers to the mysteries of the universe. It is enough to know that God loves us and provides forgiveness for our sins. God holds children in high esteem. Have you approached God like that of a child? Forget everything this world has taught you. When you were little, think back to a time when you were confused or scared and the only place you knew to turn was your Dad. You didn’t know how he would fix things, you just knew he would. You would lift your arms up to him and he would scoop you up, hold you tight and everything would be better. That’s what God does for us. What can I say? With four kids the first day of school is always a whirlwind! This was the third year in a row that I had to leave before the kids left for school…so I didn’t get to do the Happy-Mother’s-Day!-the-kids-are-finally-gone happy dance. But what a wonderful greeting when I got home from work! Backpacks and papers strewn all over the house, shoes flung haphazardly teetering upon the couch and coffee table, the kids playing video games and practically grunting their hello-mom-I-missed-you-so-much-today greeting as I walked in. I gathered all the school papers; news, calendars, lists and noticed Tristan, my 1st grader, had the most papers and stuff in his backpack. It was astonishing how much stuff he came home with on his first day of school, and after I took out all that he had left in it from LAST YEAR, he didn’t actually have so much. One of the papers Tristan brought home was titled Sneak & Share. Each kid is to bring in a special item from home to share in class, but the item is to be brought in a bag so the kids won’t be able to see it. “So what’s something special that you want to bring in?” I asked. I was in awe. I am so envious of that boldness. I love that he doesn’t have to worry about what kids think. In first grade they are accepting no matter what you look like, who your parents voted for, who your favorite football team is, or what you believe. He could be himself and share his heart without worry of ridicule. My heart flew. Oh what a joy it is to know your child loves God and wants to share Him with others! “…but what do I put in the bag?” He asked. I suggested a little Bible and he turned his nose up, then I said maybe a cross or something else and Tristan’s eyes lit up. 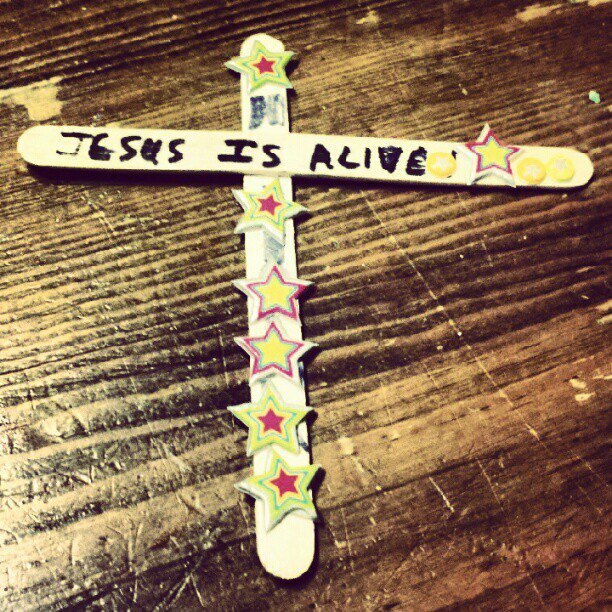 He ran over to a little popsicle cross he made at church a couple years ago that we had sitting on the thermostat on the wall. He brought it over and plopped it in the bag with a huge grin on his face. My heart fell. “Why?” I asked puzzled. Tears began streaming down Tristan’s cheeks as he struggled for a response. “Why don’t you want to bring the cross?” I prodded gently. Boy, do I see myself in him. How many times do I back down? How many times have I missed an opportunity to share God with others because of that EXACT thought? God has given us the Good News, no…the BEST News! Stand up! Go out and share it! In fact I used to say the actual phrase when I was a kid and didn’t realize, or didn’t care, the significance of it. Plus, I grew up in the 80’s (’nuff said) but with all of the “I’m sure,” “totally,” and “gag me”‘s being thrown around, it was just another valley girl phrase to add to our repertoire. That’s how the phrase is being used today, and I get it if you don’t know Christ, haven’t been churched or taught respect for the Lord, but it drives me batty when Christians, the people who are aware of what “OMG” stands for and the respect and reverence it holds and who would never be caught dead saying “Oh my God!” aloud, are ok using an acronym. Now when I was with my friends, of course I used that phrase as well as other much more colorful exclamatories, but the only time I said a swear word in front of my parents was when my Mom and I were driving out of a busy parking ramp at the Milwaukee airport. I was the only one who could see around a huge cement column and I didn’t see the car that was speeding toward us until I told her it was ok to go. She stepped on the gas, I then saw the car and said “OH SH**! !” which caused her to slam on the brakes, the car avoided us and it was never spoken of again. It sounded a bit different coming out of her mouth, so I nipped that in the bud! It didn’t too take long before I had an “Oh my word” habit formed and used it for years, and one Sunday I heard a sermon based in John. I realized at that moment that saying “Oh my Word” was existentially worse!! I was cursing Jesus himself, the One who saved me, the One who died in my place!! so I’m still entertaining the “giddleydonk” idea.